A modern day fairy tale, August Rush unabashedly celebrates pure love and the magical powers of music. In New York City of 1995, Lyla Novacek (Keri Russell) is a cellist and Louis Connelly (Jonathan Rhys Meyers) is the lead singer in an Irish rock band. They meet at a party, it's love at first sight, they spend one night together and then separate. Fate keeps them apart, but Lyla is pregnant. Months later, an accident leaves Layla unconscious, the baby boy is delivered, and her father (William Sadler) hands him to social services. When Layla awakens, she is told that the baby died. Both Layla and Louis are miserable without each other, and abandon their musical dreams. Eleven years later their son Evan Taylor (Freddie Highmore) drifts away from a boys' shelter where he has spent his life and finds his way to Manhattan. Lyla is a music teacher in Chicago, and Louis is a businessman in San Francisco. Evan has music in his blood, and finds musical inspiration in all the sounds that surround him. He falls in with a group of street musicians controlled and exploited by Maxwell "The Wizard" Wallace (Robin Williams). Evan demonstrates incredible ability with the guitar, and The Wizard starts to imagine the riches that can come his way. He renames the boy August Rush to make him more difficult to find. By now Lyla is frantically looking for Evan thanks to her father's death bed confession, and Louis is desperately searching for Layla. 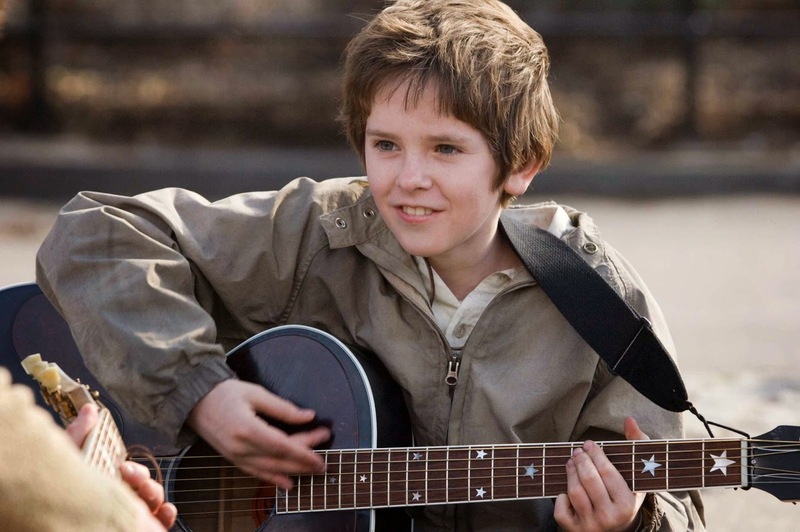 Directed by Kirsten Sheridan (daughter of Jim), August Rush is a sweet story, unapologetically borrowing elements from Oliver Twist, and bathed in the soft light of eternal optimism. Evan is a child prodigy on par with Mozart in his ability to play and compose music, and just when the time is right Lyla and Louis follow their hearts, then their instincts and finally the music to arrive at the happy ending in Central Park. As a package, it is almost impossible not to fall in love with the film's simple intentions and trust in pure innocence. This is not a film where common sense or logic need to prevail; rather, this is a place to reflect on the ethereal qualities of music, the silent and mutual attraction of souls destined to be together, and a mother's determined search for the son she never knew. The music score by Mark Mancina and Hans Zimmer adds to the mood of poignant anticipation, while John Mathieson's cinematography makes good use of the New York City locations, with Washington Square particularly prominent. Lyla, Louis and Evan clearly belong together, and spend the film overcoming obstacles to arrive at the same point in time and place. In true fable fashion all three are pure of heart and filled with nothing but good intentions, and the actors perform accordingly. Freddie Highmore exudes innocent bliss and a spirit naturally intertwined with music. Keri Russell and Jonathan Rhys Meyers are headstrong, passionate, and tender in their pursuit of the love that slipped through their fingers. Robin Williams makes for a worthy antagonist, channeling his inner Fagin as he heartlessly profits from child labour. Terrence Howard rounds out the cast as a social worker trying to help Evan. As with all the best fairy tales, August Rush exists in a place where good will triumph over evil, love will survive and thrive, and the human spirit remains positive and optimistic, all set to great music and glowing in artistic light.